---"I can't play video in iPad/iPhone/iMac with Plex"
---"I have a collection of purchased movies. Does Plex support iTunes DRM videos?" ---"I am trying to play iTunes purchased movies. When trying to play one of them it almost looks as if it is caching the movie. But won't play it. Any ideas?" 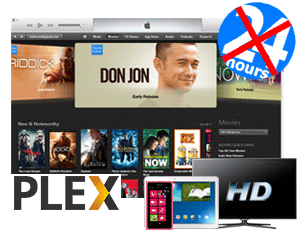 Spent a whole day on streaming iTunes movies via Plex Media Server, but in vain? You need to know that Plex Media Server is unable to play iTunes movie because of the DRM protection. Before streaming your iTunes movies from computer to TV, tablets and all your mobile devices at home, you will need to remove DRM from the movies with a powerful DRM remover like with M4VGear. M4VGear DRM Media Converter helps you remove DRM from iTunes purchases and rentals at 20X fast speed, keeping the video quality same as original. By using M4VGear DRM Media Converter , you can seamlessly stream HD iTunes movies via Plex and watch your own movies conveniently on every devices in your house. What's more, you can keep your iTunes rental forever and backup iTunes movies for convenient access. ✔ Remove iTunes Purchases and Rentals DRM. ✔ Export HD movie same as the original at 20X much faster speed. ✔ Convert M4V to MP4 for widely usage. ✔ Retain 5.1 all subtitles (including CC) after DRM video conversion. ✔ Unlock iTunes movies for non-apple devices. ✔ Keep multi-language audio tracks (including 5.1 AC3 audio track). Tips: M4VGear will offer you a 1 minute free trial which will let you convert one minute of iTunes rentals for free. If you want to unlock the time limitation, please purchase M4VGear. The price now is $44.95, decreasing from original $49.95 by $10. Plex Media Server, whose source code was initially forked from XBMC Media Center, is a third party application that helps user manage and play video, photos, music, and podcasts from a local or remote computer. In addition, it integrated channels that provide the user with a growing list of community-driven plug-in for online content including YouTube, Vimeo, TEDTalks, Hulu, Netflix, and CNN video. Plex also provides integration for cloud services including Dropbox, Box, Google Drive, Copy and Bitcasa.